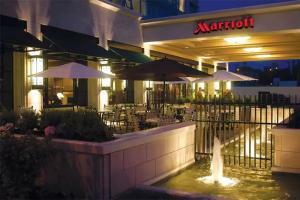 Experience the perfect blend of modern style and comfort at Victoria Marriott Inner Harbour. Before exploring the area, get a good night's sleep inspired by their luxury bedding, or take care of your work obligations using the rooms' ergonomic workstations and complimentary high-speed WiFi. Head down to Fire & Water Fish and Chophouse, for delicious breakfast, lunch and dinner options. Once fueled up, take a trip to the fitness center with cardio equipment and free weights. After your workout, cool down with a refreshing dip in the indoor pool. The Undersea Gardens and Royal British Columbia Museum is a 10 minute walk from the hotel, and Victoria International Airport is a 30 minute drive away. Royal BC Museum, Butchart Gardens, 5 Star - Whale Watching, Government House, Harbour Air (Seaplane), IMAX Theater, Hatley Castle, Cinatown, Fisherman's Wharf are all less than 12 miles from the hotel.